Hellertown Postmaster Joe DiRusso, left, receives help from volunteer Bill Frey with hanging a 1906 post office sign above the customer service counter at the Hellertown Post Office. 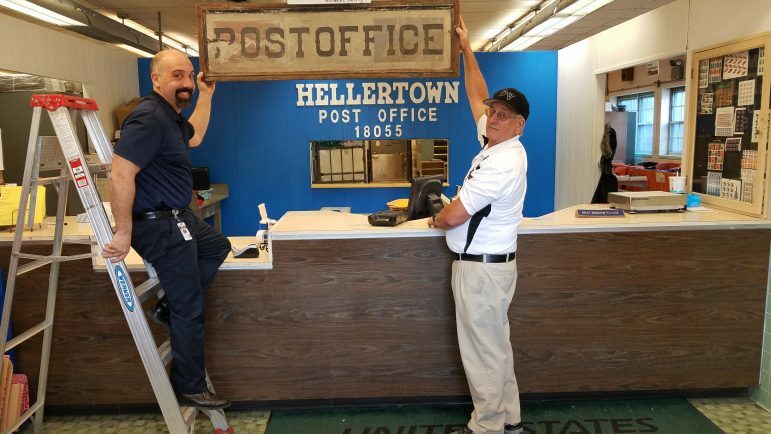 The sign is on loan from the Hellertown Historical Society for the post office building’s 50th anniversary celebration this spring. The history of the U.S. Postal Service in Hellertown goes back much further than 50 years, but it is a fiftieth anniversary that will be celebrated by the borough post office and its current employees on April 17. This year marks the fiftieth anniversary of the opening of the post office building at Delaware Avenue and Water Street–a local landmark–and in celebration of that milestone visitors will find a lobby display that tells the story of U.S. mail service in Hellertown from the earliest days of delivery to today. Hellertown Postmaster Joe DiRusso said that’s nearly 150 years of history. DiRusso received a hand from the Hellertown Historical Society and member-volunteer Bill Frey in assembling the display, which includes historic photos, maps, postage, letters and even a weathered wooden hanging sign that dates from the early 1900s. That sign can be seen in a historic photo (below) of the first Hellertown Post Office building, which was located in a building that stood just south of where Hellertown Borough Hall is located today. The 50th anniversary celebration will be held along with the Hellertown-Lower Saucon Chamber of Commerce from 4:30 to 6:30 p.m. April 17 at the post office, which is located at 660 Delaware Ave., Hellertown, Pa. There will be a ribbon-cutting ceremony, an open house and light refreshments served. Additional details will be announced closer to the date. 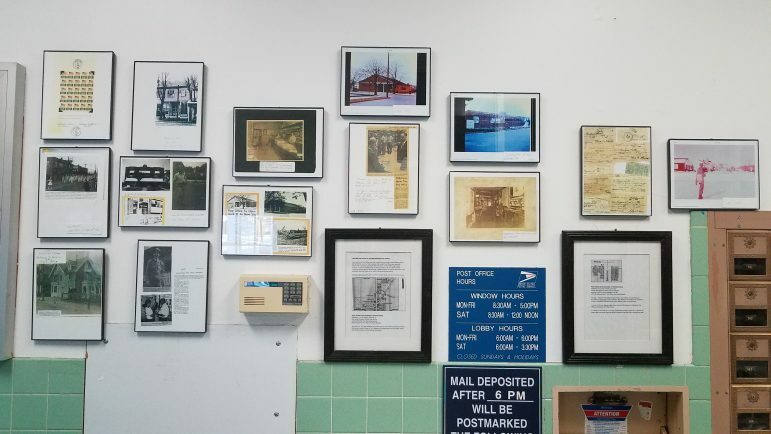 A display in the lobby of the Hellertown Post Office tells the story of mail delivery in the borough over the past 150 years. 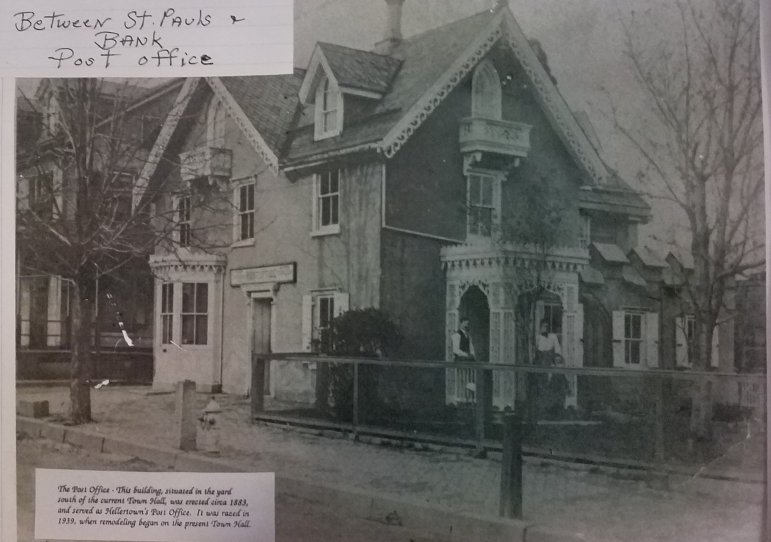 A rare photo shows the first Hellertown post office circa 1900. The branch was located in this building just south of Hellertown Borough Hall, where today there is a grassy area. It was razed in 1939 during the development of the Borough Hall complex.